The Moon did it again. 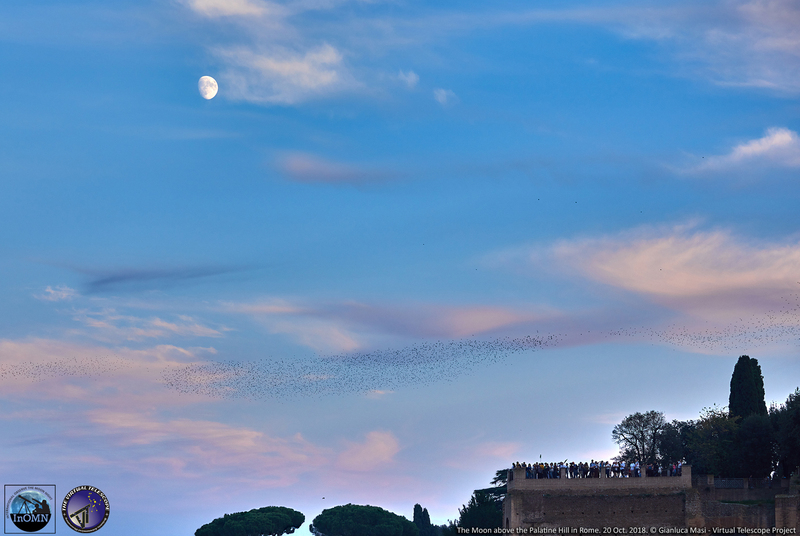 Its “International Observe the Moon Night” (InOMN 2018) was a huge planetary success and we could share its view from Rome with the world, facing the glory of the Roman Forum and the Colosseum. Here they are a few images and the podcast from the live feed. 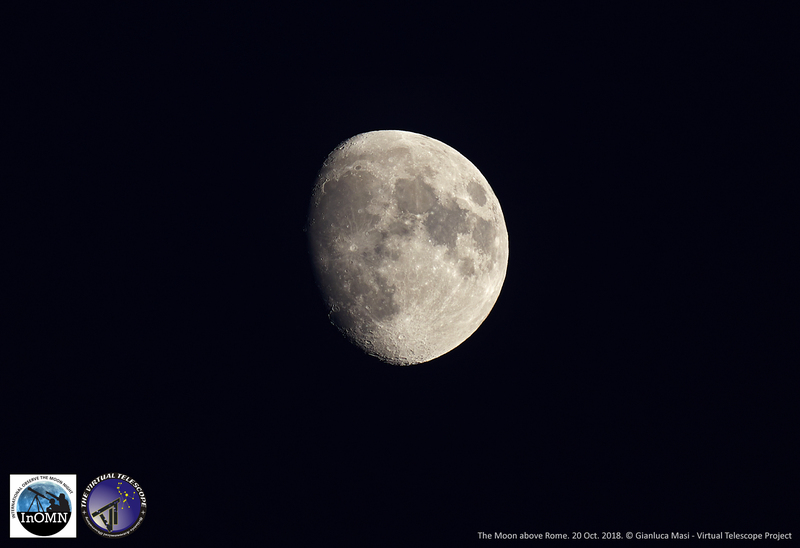 After the huge success of our live feed in 2017, we really wanted to do it again, so the Virtual Telescope Project scheduled an online observing session for the International Observe the Moon Night 2018 (InOMN 2018), too. Many events were going to happen worldwide and, beside the format of our proposal, making possible for people unable to reach physical venue to join the party anyway, we wanted our event to be different, as it was last year. 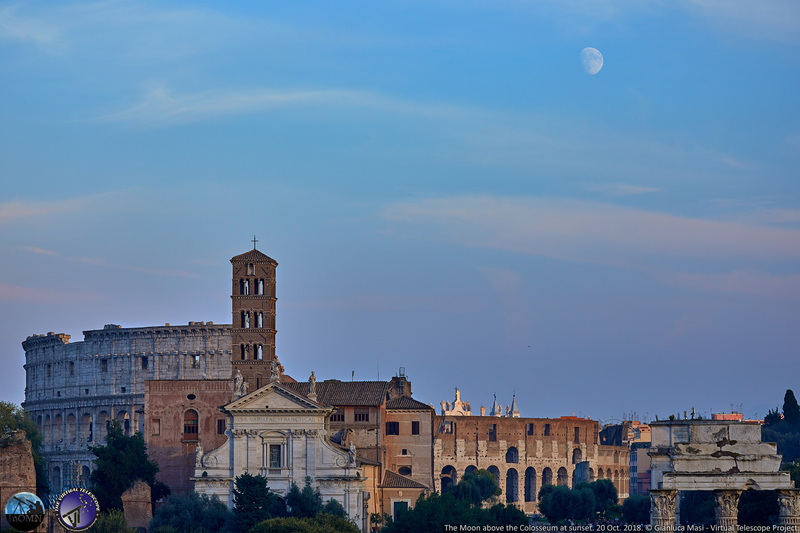 Again, we wanted to show the Moon, of course, but with the bonus of the skyline of Rome, the Eternal City. We believe this choice could honor one of the ideas behind the InOMN 2018: the connection between the Moon and our home planet and culture. We carefully selected the location where to setup our roving instruments, finally choosing a nice scenic point facing South-East and having the Roman Forum and the Colosseum in that direction! Our new 2019 Wall calendar is now available: free shipping! I reached the place well before sunset, to have everything ready on time and to capture any possible view and emotion. 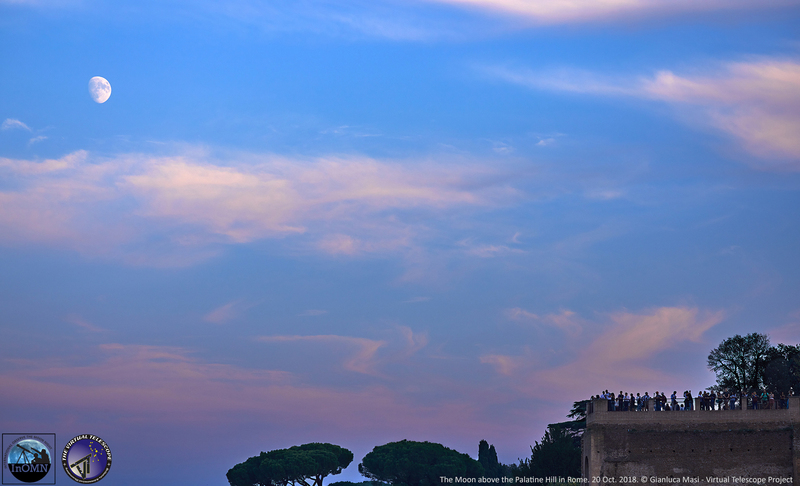 In particular, I was attracted by the idea to image the Moon above the Colosseum while the Sun was still up in the sky, loving the very pale presence of our satellite. Needless to say, I enjoyed the view at sunset: our star was leaving the sky on the opposite direction and when the Sun was saying “Goodbye”, I could capture the image below. 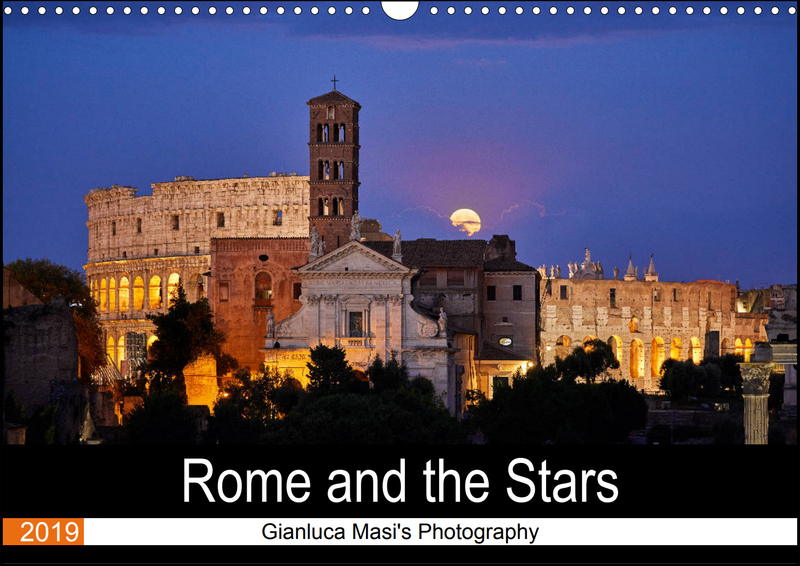 At that time, the Roman Forum and the sites around were still opened to tourists and I loved to see people enjoying the panorama from a terrace on the Palatine Hill, ideally looking at the Moon too. I really wanted to grab such a connection between the satellite, the place and the people. They seemed to be ready to jump to the Moon! At some point, I spotted an airplane moving in the sky exactly in the direction of the Moon and prepared to capture it. Such a funny event was nice to ideally celebrate the first men of the Apollo 8 orbiting the Moon almost exactly 50 years ago. 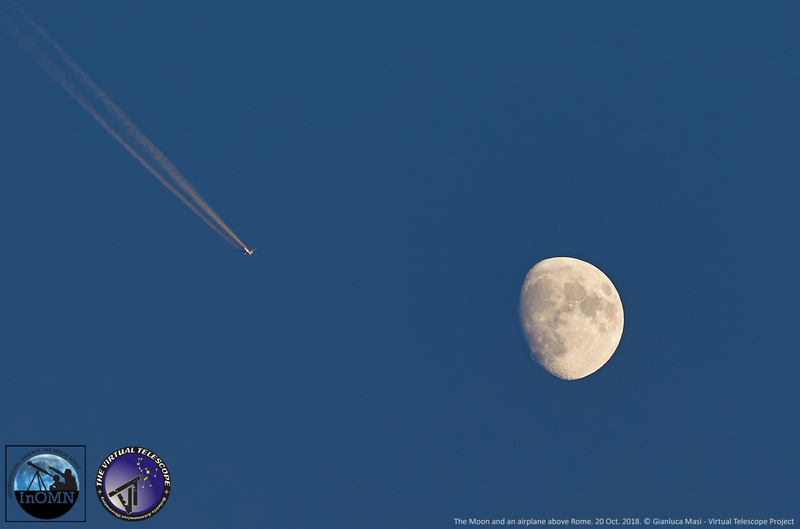 I have thought that “Fly me to the Moon” could be a nice song to listen to in that very moment! As you can see, there were some clouds around and at some point they were covering the sky more and more, clearly approaching the part of the sky where our Moon was shining. Before that, I captured a final image, this time concentrating on the satellite itself, showing its main features: craters, mounts and seas. I was extremely happy with the experience and learning that thousands of people had fun with us was very rewarding. Let me say it was not easy to run alone this complex task out there, with such a complex hardware (a tripod, a huge photographic lens, a DSLR body, a computer and a modem) on a public balcony, but it was well worth the effort! Below is the podcast from our live feed. I’m looking forward to share the sky with you again soon!